Captive Killer Whales: Should Marine Mammals be Trained to Perform? We know whales are smart because they have been observed using cooperative hunting techniques. For example, a vast school of herring is scattered about in the Lynn Canal, an area in southeastern Alaska. The humpback whales begin their strategy for breakfast. The whales collectively dive beneath the herring. In unison, they emit high-pitched calls and frighten the fish upward. Finally, the whales swim in a cooperative circle while blowing bubbles that rise to the surface. This creates a barrier the fish will not breach. The fish panic and pack themselves into a dense mass of wriggling, swimming chaos, becoming a tighter circle. The lead whale gives a loud squeal and the other whales fly up to the surface, mouths open, and scoop up massive amounts of herring. This behavior is called bubblenet feeding and continues several times a morning as all the whales consume up to 2,000 pounds (907 kg) of herring each day. Whales give birth to live young and produce milk to feed them. Being warm-blooded, their bodies maintain a constant temperature that is usually warmer than their surroundings. That’s why they have an insulation coat of blubber to guard against the reduction of heat for their organs. Since mammals need to breathe air, whales regularly swim to water’s surface. They use a blowhole to breathe through, a type of nostril on the top of its head. Oxygen is stored with the aid of a substance called myoglobin—a protein found in the muscle tissue—that allows them to stay underwater for long periods (up to two hours with a species such as the sperm whale). Largest of any animals on Earth, the sperm whale’s brain weighs about 20 pounds (9 kg). Scientists generally agreed that whales are smart because certain areas of their brains are well-developed, particularly the area for cognition. This allows them to acquire knowledge and understand typically complex concepts. Whales reared in captivity can solve problems and overcome boredom by creating playful activities. That’s why they have been proven to be fairly easy to train for waterpark theatrical shows. If you have ever heard whale song, it is both beautiful and mystifying. Baleen whales have folds of tissue to make true vocalization of pitch and tone. Some of the loudest animal sounds on Earth, other baleen whales can hear the communication up to 100 miles (161 km) away. Toothed whales communicate by generating clicks because they don’t have those folds, but they create many different sounds: whistles, squeaks, and deep groans. This is echolocation, which is sonar that helps them “see" by sensing objects from these echoes. Whales also communicate by making big splashes. Certain species will propel themselves out of water and fall quickly back in a huge splash—called breaching—demonstrating to females their strength. Male also smack their tails on the water’s surface to warn off rivals. There is something magical about visiting an aquarium and orca whales are awe-inspiring, but should they work in closed captivity? At parks such as SeaWorld, they are trained to use all those things we have just talked about: squirting water, playing games, breaching, smacking their tails and more. Over 50 years ago, Ted Griffin had a vision of riding on the back of a whale. Obsessed with the idea, he captured and displayed a whale for America’s first orca show. It’s a misnomer to call them killer whales, as orcas are peaceful and the somewhat solitary animals of the sea. However, in recent years, things have gone very wrong. 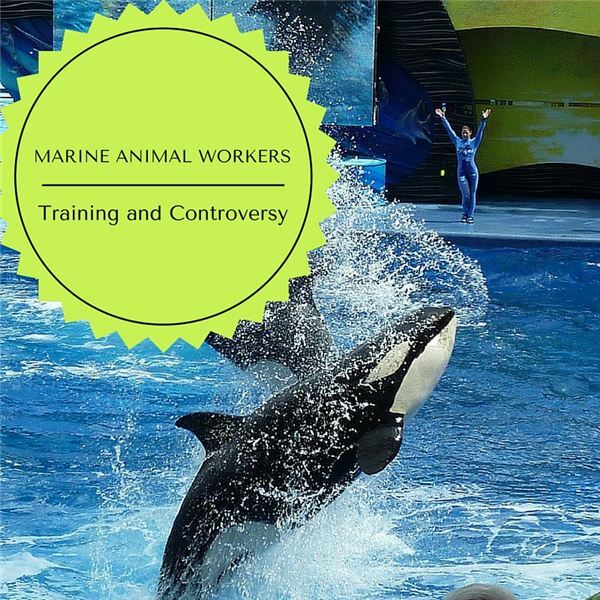 According to Jay C. Sweeney, a veterinarian who writes in the CRC Handbook of Marine Mammal Medicine, “Aggression expressed by killer whales toward their trainers is a matter of grave concern." Previous belligerent behavior toward trainers includes a litany of bad behavior: butting, biting, grabbing, dunking and holding trainers on the bottom of pools and preventing their escape. The effects of captivity on orcas are often hotly debated. The Humane Society and other animal rights groups believe these social animals fail to thrive in aquariums and parks. Nutritionally the whales are given strange supplements, and subjected to weird procedures such as feeding them large quantities of gelatin to protect against dehydration. Their dental care becomes problematic and they have skin anomalies. Unable to have large areas of the sea to swim in, they develop aberrant behaviors that include aggressiveness and attacks on people. Wild orcas are not associated with killing humans, but there are records of four trainers at water park theaters who have been killed. Not only that, but the working orca’s life span has been comprised. Many develop a compromised immune system and are subject to infection and stress. In the Pacific Northwest, wild males can live up to 70 years and females 90 years or more (as an average that comes out to a life expectancy of 46 years). Many captive SeaWorld whales die in their teens and twenties. The documentary Blackfish explores the death of Dawn Brancheau, a SeaWorld trainer who was attacked by Tilikum, one of the whales she helped train. SeaWorld defended their position as a respected zoological institution. They cited their 50 years of service to help teach conservation and illustrate the need to preserve and care for thousands of ill, orphaned and injured animals they have rescued. There have been other fatalities as well, perhaps less publicized, such as a 27-year old patron who snuck back into the exhibit and was found floating on his back in a tank at SeaWorld in 1999. While it was stupid to think he could interact with a wild animal, Tilikum was blamed for the death and authorities said the man was a victim of his horseplay. The Orange County Sheriff’s Office said the man apparently hid in the park until after it closed and then climbed into the tank. Talk to anyone who works at a zoo, animal park or sanctuary and they will be the first ones to tell you that dangerous animals often do what is inherent in their makeup. Being kept in confined areas and made to do tricks repetitively is not the life they were meant to live in. Today, many of these facilities are made up largely of rescued and abused animals with many born into captivity. In 2016, SeaWorld has announced a huge change in its program by putting an end to keeping captive orcas for public displays. In addition, all breeding programs will stop for the company’s 30-plus whales. This will be the last generation of captive orcas. The Killer Whale shows will stop in San Diego and the theme park will collaborate with the Humane Society of the United States and commit $50 million to help animals in the wild. All theatrical shows (in San Antonio and Orlando) will stop by 2019 and, a great issue: more rescue and rehabilitation. Gish, Melissa. Whales. Mankato, MN: Creative Education, 2012. Crist, Darlene Trew et al. World Ocean Census: A global survey of marine life. Buffalo, NY: A Firefly Book, 2009.